You are currently browsing the tag archive for the ‘Portland marathon’ tag. Yesterday was one of the toughest days of my life. How lucky am I! Some people run marathons with very little training. We might call them silly; perhaps even laugh at them. Some of these folks post amazing performances, however. Such is the story of Zachary, Annie’s husband. He works full-time and carries a full-time college schedule. 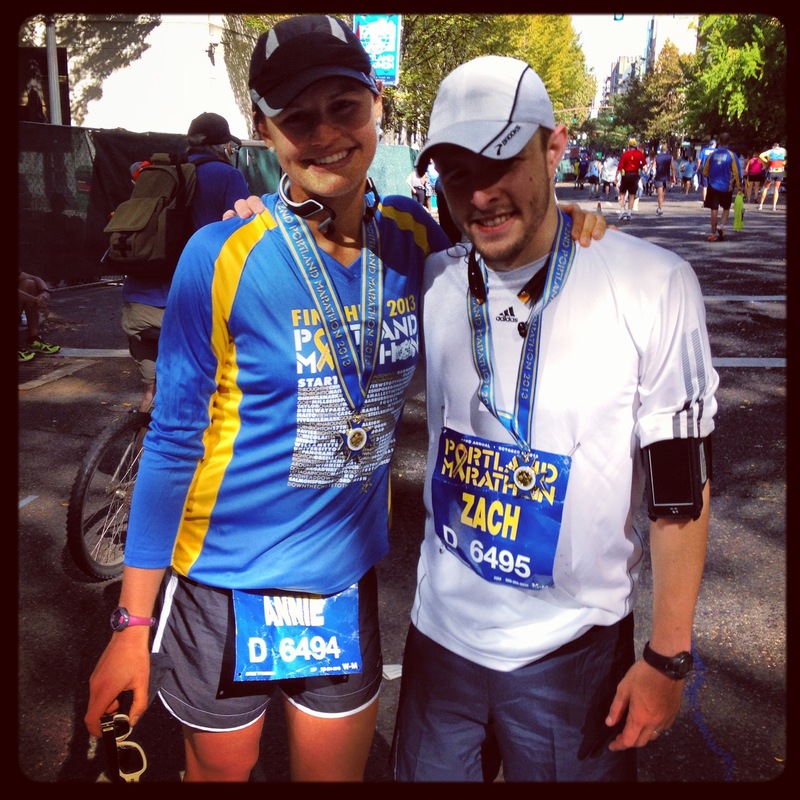 Despite minimal training, including no recent runs longer than six miles, Zach hung with Annie for most of the 2013 Portland Marathon, slowing only for the last few miles. His time of 4:58 was better than Annie and I ran at Coeur d’Alene in May, after substantial training. Who would have guessed he’d pull this off? Not me! 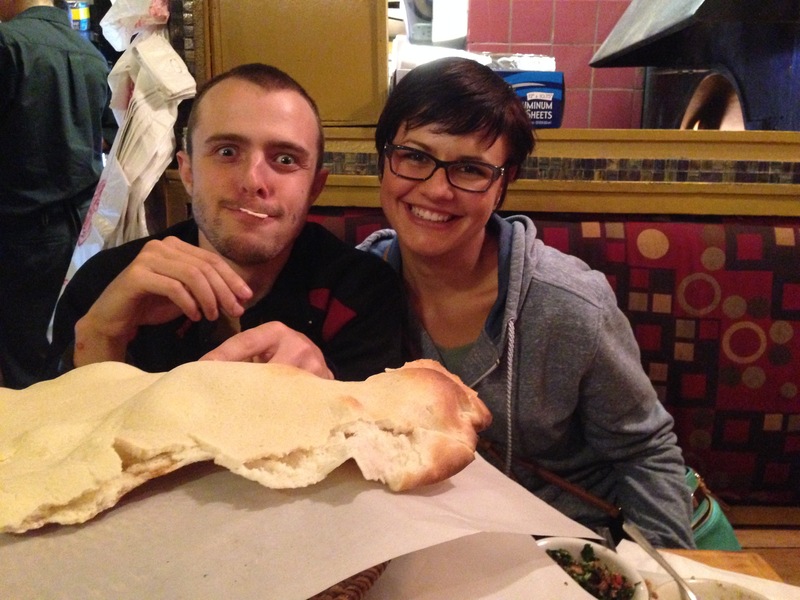 Maybe it was the Lebanese food we powered up with on Saturday evening? Zach’s not crazy. I promise! Wait…am I a qualified judge? Life is a bundle of richly varied experiences, which we can choose to learn from at our own pace. After moderate training for a marathon, then tapering, I felt pretty strong. 26.2 miles is a long ways, however, no matter how strong one feels. We all get to decide what pace to run. Portland’s lizard pacers offered help, but which group to choose? For me, a targeted finish of 4:25 or 4:40? My spunky ego took the 4:25 sign in front of me at the start as evidence enough. I soon learned two important lessons: (1) Many people bunch near the pacers, at least early in the race. (2) Pacers don’t stop for drinks or porta-potties. What to do? Get ahead of them! Having tossed out the good advice to start slow, I sped up a little more! The tantalizing feelings of strength and optimism fueled my ego and ramped up my hopes. Goodbye 4:25ers! I became mostly convinced that I should run faster while I was feeling good. I wasn’t a rookie, so I knew tougher times were coming. But why not make hay while the sun was shining? Several minutes after a hairpin turn, as we met oncoming runners, I heard Annie yell “Go Frankoshanko!” I smiled and yelled back. I did likewise for the dozens of people who yelled “Go Cougs” in response to my shirt. I kept a pace that felt good. So I enjoyed many miles faster than my ten minute per mile target. When I ran a mile in 8:40, I questioned the measurements, before realizing how much I had picked up the pace. Was I going too fast? My muscles started to feel the effects around ten miles in. It’s a progressive thing, so I was curious how I’d hold up for sixteen more miles. What could I do? It seemed reasonable to keep running the best pace I could, hydrate often, eat periodic gels and see what happened! Portland is a big race. Unlike Coeur d’Alene, there are a lot of competitors. It feels like a long version of Bloomsday. But as tough as Bloomsday is, this race is much tougher. Simply put, it’s three and a half times as long. Other runners can affect us, if we choose. Some finish strong and fight off the overwhelming, compelling urge to walk, especially near the end. But a lot of people do walk. I mean a LOT! Where do I fit in? I didn’t want to live with remorse throughout the winter! I decided to stick with the winners! The truth is, I really couldn’t stick with many of them, including the 4:25 lizard who passed me late in the race. But I tried! I gave the race everything I had. There is satisfaction in that. My pain was real. My left leg almost gave out on one step. My right leg spasmed on another. Both legs felt the heaviest they ever had. My groin tightened. I had little energy. I was down to a plod at the end. It seemed like each step was a monumental achievement. The course just wouldn’t end! My 2:07 first half was followed by a 2:22 second half, including 13:08 on mile seventeen, which had the big hill. But I stared fear in the face and fought back. I gave it all I had! I was more tired, wobbly and spent in the finisher’s corral than I’ve ever been before. I had trained moderately well. I got what I deserved. I didn’t quit. I finished strong. It felt exhaustingly good! I had just started to eye the post-race refreshments when I heard “Hi Daddy!” What? It was Annie. “How’d you get here?” was my immediate response. 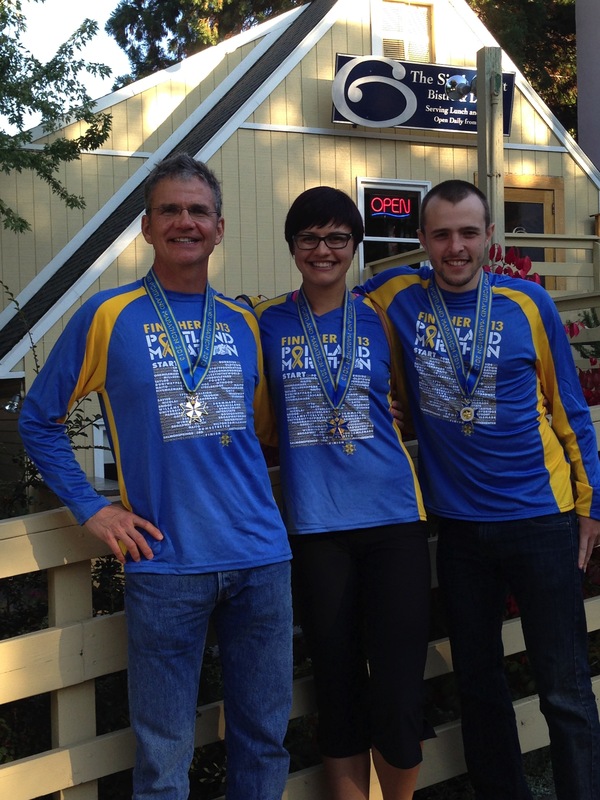 Post-race delirium and best-of-life surprise gave way to fatherly pride. 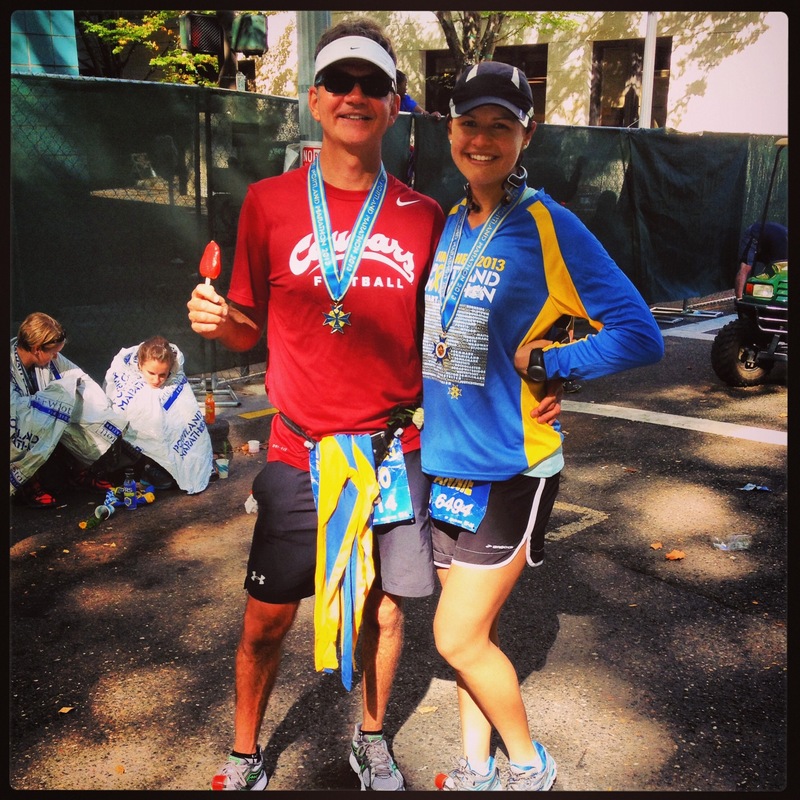 She’d nearly caught me over the second half of the race, overcoming her knee injury, which limited her training, and her busy schedule of nursing school, work and homemaking. Perhaps our wild adventures helped? Annie and I each shed about half an hour from Coeur d’Alene, with less training. Annie, Zach and I all ran way faster than I thought we would. How’s that for miraculous? The friendly people of Portland did many things very well, including water stops, a well staged start, traffic control, encouragement, shirt and medal design, space blankets and delightful frozen strawberry bars at the finish! Today was a day for excruciatingly painful quadricep massage. The Stick is my best friend and my worst enemy! After work, I spent an hour at the gym lifting weights and stretching my leg muscles. I’m grateful for the pain. It means I’m still on the road to a better life. I’ve seen no other road I’d rather be on!